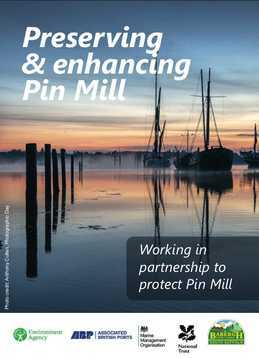 Pin Mill Hard and the adjacent area, along with various associated facilities, have undergone major improvements and upgrading, with substantial Civil Engineering works being carried out to the “Hard”. These have included, renewing the Barge Blocks, Mooring and Scrubbing Posts, improving and resurfacing the “Hard” surface and the renewal of the edge of the “Grindle”. This now provides more much needed and improved facilities for Barges and Yachts, along with making the whole area more attractive for visitors. All this has only been possible after many years of discussion, planning and negotiation, and as a result of a joint initiative and the close cooperation between Babergh District Council and all the many local interests, including residents, businesses and other associated parties and organisations. The actual work carried out was only possible with the substantial assistance and funding by Babergh District Council and Haven Gateway Partnership and various other bodies and organisations. In order to continue with this aim, various charges were introduced from the 1st January 2011 for certain aspects of the use of these facilities, details of these are available under tariffs. A lot of work and effort has been put in, and will continue to be, by all those involved with PMBMCIC, with the fundamental intention to maintain and improve all the facilities in our area of administration for the common good, benefit, and use of those who visit Pin Mill, whatever the reason; this particularly applies to traditional craft, such as Thames Sailing Barges, whose presence has always given Pin Mill its own unique character. There is already a further works list drawn up, and these various tasks will be carried out in the near future and will be ongoing, as soon as funds and resources are available. Individuals may continue to self-launch & recover small craft up to 5M LOA, at no charge. Dinghies and tenders can still come and go or moor gratis for reasonable short periods of time and other craft, can still moor on the “Hard” free of charge, for repairs or scrubbing etc., for up to 2 days, provided they do not impede the commercial operations that are regularly and normally carried out on the hard.